Like the Brits and the Irish, the Aussies know how to throw a good party at SXSW. 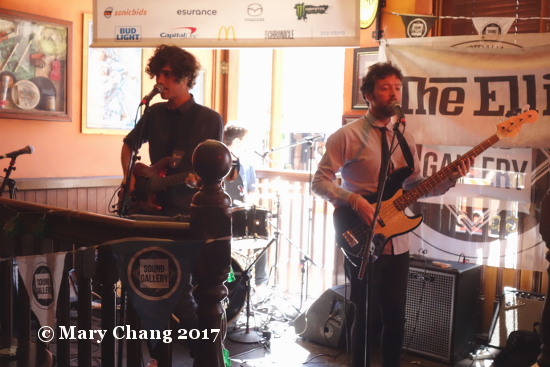 This was true this year at SXSW 2017, where they put on two acoustic-focussed lineups – Sound Gallery I and II – at Irish pub B.D. Riley’s on the Tuesday and Saturday afternoons of the festival. These showcases are brilliant, because those of us who can’t catch Aussie bands during their evening showcases have a second (sometimes third) opportunity to see them, exponentially increasing their acts’ opportunities in front of punters and industry folk. Sessions of Sound Gallery I and II were in addition to not one, but two afternoons they had booked in the East Test of Brush Square Park on Thursday and Friday, the Friday used specifically to accommodate the many electronic acts coming out of Oz. The Elliotts are from Melbourne, argued by many to be the cultural capital of Australia, and they have a fresh pop sound sure to keep your toes tapping. Call him James, Jimmy or Wally (far right on the photo at the top of this page), one of two lead singers in the band and their bass player (or at least in Austin); I chatted with him outside B.D. Riley’s after their rousing set on Tuesday afternoon. Have a listen to our conversation on the ground on 6th Street below. They will be touring here in America for the next 2 weeks; show them some love by checking out their gig list here.